What does the Cincinnati Museum Center and the Tropicana have in common? So, what does the Cincinnati Museum Center and the Tropicana Casino have in common? They’re both currently showing Bodies the Exhibition! It’s funny how at the Tropicana it’s listed as “Entertainment”. So, now you can play some slots and then check out some dead people. 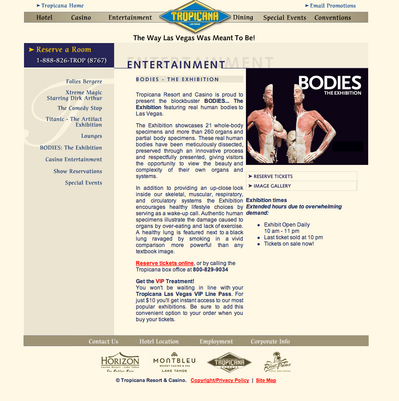 So, is Bodies the Exhibition really about education or is it about entertaining and profiting off of the dead? Are there 13 Cylon Models in Battlestar Galactica?